Instrumental arrangements of American Gospel songs. 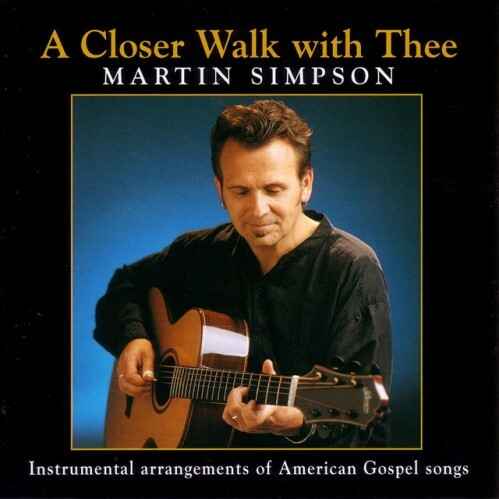 Martin Simpson is simply one of the most talented folk-rooted acoustic guitar players in the world, and he has plenty of opportunities to demonstrate his sensitive musicianship on A Closer Walk With Thee, a collection of traditional gospel tunes. On many of the tracks, Simpson has overdubbed baritone guitars, mandolas, and mandolins over his stunningly beautiful acoustic arrangements. Additionally, he has enlisted other musicians to supply, at times, trumpet, flugelhorn, harmonica, strings, and banjo. All of this instrumentation is used to great effect on such tracks as "Palms of Victory," where the simple yet moving melody is traded off among the different instruments in an extremely effective fashion. Simpson is an excellent slide player as well, and his sweet touch is demonstrated on "Satan, Your Kingdom Must Come Down" and elsewhere. It should be said that Simpson and company do not just play the tunes straight, but rather use some creative arranging to maximize the impact of each of the songs, which are fairly simple in their own right. One questionable call is Joe Weed's dense string arrangements, which may strike some listeners, especially those who tend to be purists, as overkill. Idiomatic or not, they are dramatic and stirring, and considering that Simpson's goal is not to record these tunes exactly like someone might have done it in the '20s, but to bring out the timeless character of these melodies and sonorities in new ways, they work marvelously. This is a very impressive effort from Martin Simpson and is well-worth the attention of anyone who loves American folk music.